And we do mean sour. 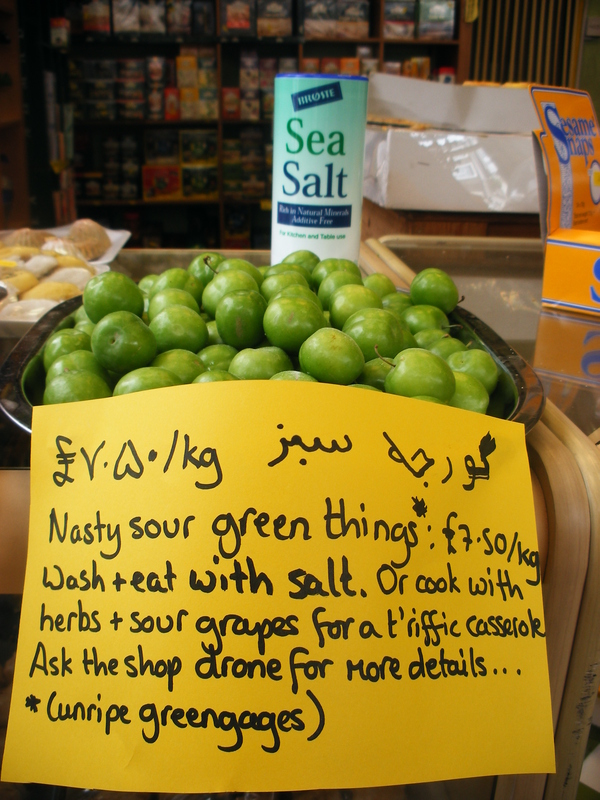 Gojeh sabz, or unripened greengages, are as popular in Iran as, let’s say, strawberries are in the UK. They do of course grow over here – but we tend to regard them as a rather old-fashioned fruit, something for your grandmother to make into jam perhaps, and we also usually wait for them to sweeten and drop. Most commonly Iranians wash them and sprinkle them with salt to enjoy as a cheek-suckingly sharp snack. They look forward with child-like glee to the first gojeh of spring, and scrabble to get their fill. Mr. Shopkeeper is currently to be found chomping on them by the score in the wee small hours (as he watches his Babylon 5 boxset; shh – don’t tell). But in certain parts of the country they are incorporated into one of the classic khoresht (casserole) dishes to make a gorgeous salt-sour springtime casserole. And as we are having it for dinner tonight, it seemed mean not to share the recipe with you. It is, we have to say, a cracking recipe to add to your things-to-do-with-chicken portfolio. Remove the twiggier bits of stalk from the parsley and the mint, and wash the leaves thoroughly before setting them to drain. Pop the chicken into a large saucepan, add the onion and turmeric, and cover it with cold water. Bring the contents of the pan to the boil, and then set it to simmer for around half an hour. Next chop the herbs, then heat a little oil in a frying pan and gently fry them off, turning them constantly so they do not catch or clump. They will need about 7-8 minutes to cook. Taking care not to drizzle too much of the oil into the pan, scoop the herbs on to the bubbling chicken and mix well. After another 10 minutes, drop the whole greengages into the casserole, and allow it to simmer for a further 10-15 minutes, or until the chicken is just coming off the bone and the gojeh are soft. Season it to taste, and if you feel it is not sharp enough add a little verjuice or lemon juice. Serve the khoresht over plain or smoked basmati rice with raw onion, garlic and plain yoghurt. And some extra black pepper. I know this web site provides quality depending articles or reviews and additional stuff, is there any other web site which presents these data in quality?